My platoon now holds the Alpha Company (and probably the Task Force) record for the longest mission. We spent almost 40 hours outside yesterday and the day before. I'm not sure how much ground we covered, but I would estimate something close to 200 kilometers. We found lots of IEDs, blew up caches, got in a firefight, got blown up, stuck, tired, muddy and gross. More on that soon (with pictures!). Q: Why did the Iraqi cross the road? A: His IED was on the other side. A Marine is working on a Police Training and Transition (PTT) team. Two of his Iraqi Police trainees grab an insurgent, who calls out "By Hussein, let me go!". The IPs drop the insurgent, who runs away. The Marine, astonished, asks why they released the man, and the IPs explain: "He asked for mercy by Hussein, the son of the Prophet, and custom demands that we set him free." A week or two later, the Marine is captured by insurgents. He remembers the IPs, and decides to give it a whirl, so he calls out "By Hussein, let me go!" The leader of the insurgents stares at him for a moment, and then says to the others: "Not only is he an American dog, he's a Shiite too! Kill him!" We rolled back to Ramadi early Sunday afternoon, after a long rotation out to Falluja. I took my personal gear and my 240B machine gun into the barracks, and stopped in to say hello to my medic buddy. I was headed back out to the 5-ton dump truck that we use to transport gear for another load of rucksacks and bags when the air split with a loud craaack-BOOM, and the ground shook underfoot. Everyone flinched towards the ground, and someone dryly cracked "That didn't sound like outgoing". A large black smoke plume shot into the air somewhere over towards the gate, turning grey as it mixed with the dusty sky. Black smoke, for a VBIED. I don't know why the VBIEDs always shoot black smoke into the sky, but they invariably do. The next few minutes were filled with the confused rush that follows a big blast- phones ringing, squad leaders checking to make sure all their men are ok, and a general babble of voices asking what happened? Who's dead? The big voice sounded- "Clear all roads from the south gate to Charlie Med. Clear all roads from the south gate to Charlie Med." Minutes pass, and sirens begin to sound in the distance. The big voice drowns out the noise- "All interpreters and medics report to Charlie Med. All interpreters and medics to Charlie Med." Time passed, and more details began to filter in. The blast was just outside the police station on the south side of the camp. The station is technically on Camp Ramadi- inside the outer perimeter, but outside the main gate. Two pickup trucks had approached the station- the lead truck exploded, and the second sped away. Twenty minutes later, another VBIED (possibly the other truck) exploded in another district of Ramadi. The blast at the police station collapsed a nearby house killing 3 civilians inside, and wounded 35 more, including 5 policemen. The wounded began streaming into Ramadi, where two of my medic friends helped to treat them. Welcome back to Camp Ramadi, ladies and gentlemen. The new Transformers movie is coming out on July 4th. I saw a teaser for it a few days ago, and got a big surprise. One of the Transformers, Bonecrusher, masquerades as a BUFFALO. Yes, the big IED-hunting truck that we drive. My first thought was "Hey, he's a BUFFALO! That's awesome!". After that initial reaction, I got to thinking. Technically, I am not supposed to post pictures of the BUFFALO. Depending on who you ask, I am not even supposed to mention it by name, yet I find promotion material for a major feature film proudly displaying that sacred grail of American combat vehicles- the BUFFALO. It's not as if the truck merely appears without explanation, either: a little searching on my part turned up a newspaper article about the BUFFALO cameo. The article gave the name of the truck, its designed purpose, the name of the manufacturer, and also quoted some boasting about the BUFFALO's performance in Iraq. Do I think that's a problem? No, I don't. I feel that Americans need to be as informed as possible about what we are doing to combat the IED threat, within reasonable guidelines to maintain security. I routinely receive emails that say something to the effect of "Wow, what you guys do is great! I never knew we had ways to find IEDs. I thought our soldiers just tried to dodge them when they blew up.". The problem that I see is that the American public got more information about the the lives saved by route clearance units because of a fictional movie than they have from the military. We're winning the war on the ground, slowly, but surely, but we're waging a terribly inept battle in our presentation of it. If this war is lost, it will be for wont of good PR, not for wont of heart and success on the part of the fighters. I need to give the military PAOs some credit. They have really been trying to step up and tell the military side of the tale recently. Adding a YouTube channel was a very good development, as I wrote about before. There are reporters in Al Anbar now who are doing very good work on reporting all the news, both good and bad. Still, there's a long ways to go. As I continued musing, I had another thought: Transformers was being filmed at the end of 2006- the time when my unit was mobilizing, training, and deploying. We trained for route clearance with a plywood mock up of a BUFFALO wedged into the back of a 5-ton dump truck. I wouldn't call it the most realistic training I ever experienced. Our training at the National Training Center earlier last year in California's Mojave was better, but we didn't have a BUFFALO there, either. The first time most members of my unit touched a BUFFALO was when our boots hit the dust in Ramadi, Iraq. Why, you ask? The reason was good enough- all BUFFALOs were being sent to Iraq. The BUFFALO is a new vehicle for the Army; it was purchased solely because of the emerging IED threat. It takes time to build up assembly lines to provide big, complex vehicles like BUFFALOs. Under those circumstances, you do the best you can to learn, knowing that the actual vehicles are going somewhere they are needed more. Or were they? I can think of one BUFFALO that was neither conducting missions in Iraq, nor training troops in the states. Perhaps the BUFFALO that you will see in a few months in Transformers is a display model, or somehow non-operational. I hope that's the case. I would hate to feel cheated. Two weeks ago, along with another route clearance unit, my platoon spearheaded a large operation south of Falluja,. We cleared two routes into the farmland for over six hundred Marines and soldiers who were to operate in the area over the next few days. The Route Clearance team at the staging area. L>R: 2 Humvees, HEMMT Wrecker, HUSKY, Cougar. We traveled to the operation staging area early, and took our places among the tanks, trucks, and other vehicles. The gravel lot of the staging area was bigger than a football field, and the entire surface was filled with lines of vehicles. Marines clustered around groups of trucks making final checks and preparations. The Marines would be leaving some time after we started so as not to be held up on the road by our delays in disarming bombs. Most took the chance to eat another hot meal- the last they would see in days. Others took the opportunity to stock up on other needed commodities. The mission began just before sunset. We drove to the gate, and past the guards. We passed the concrete barriers printed in large red letters “COMPLACENCY KILLS”. We bumped through the ruts of hundreds of tanks and trucks, and out past the perimeter wire. We drove out into the gathering night and started looking for bombs. It was well past dark, and the moon was peeking from behind the clouds when we found the first IED of the night. A few hundred meters and not so many minutes later, we found a second bomb. The night was proving busier than we had expected. We had completed clearing about two-thirds of the first route when we got the order to turn around and proceed to second route of the evening. Finishing the first route was lower priority than clearing the second and allowing the Marines who would follow us to insert before daylight. After a short trip along Route Mobile, the major freeway connecting Ramadi, Falluja, and Baghdad, we pressed down into the darkness along the second route. This route is only a few kilometers from the first, separated by a deep canal. The Marines following us will set up checkpoints and occupy positions in order to catch fleeing insurgents as the first group of Marines sweeps them out. These roads are familiar territory for us- we patrol them often, and we regularly disable IEDs here. This time, however, there was nothing. As we neared the end, there was a large explosion across the canal. The radio crackled- the Marines had found and detonated a parked car rigged as a VBIED on the first route, further down than we had cleared. They would go on to find several more IEDs. For us, though, the night is almost over. We reach the limit of our advance and turn around again, threading through the Marines that have already begun to stretch out and dig in behind us. We barely beat the dawn into Falluja, and settle in for the day, exhausted by the constant strain of searching for bombs. Last Sunday was Easter, and so we went on an easter egg hunt. Eggs come in many shapes and sizes here, and almost all of them are deadly. We find them, sometimes we paint them, and rarely- we collect them. One type of bomb that we commonly find is the "speed bump". The name is inspired by the appearance of the bomb, and makes for some humorous moments in the truck when someone fails to specify that we are approaching a *non-explosive* speed bump. The insurgents make speed bumps from a wide variety of material- the common factor among all is a slim profile that blends in well on dirt roads or in potholes. Sometimes, the insurgents sandwich plastic explosive between baking trays. On other occasions, the casing is welded steel packed with explosive. A few have been found that consisted of two 2x4s with explosive in the middle. They don't pose much of a threat to us- most bombs don't. A speed bump throws less shrapnel than a shell, and the blast is deflected by the v-shaped hulls of our vehicles. They can damage a humvee, though, and damage it badly if the bomb detonates under the soft belly. On Easter, we were out all night, but all we found were a few bunnies (and a hedgehog). The times are changing at Camp Falluja. It's not just the situation outside the camp, though we've seen many changes there. The summer is coming, bringing hot air and dust storms.New Marines are arriving in Falluja, and before long, others will go home again. The chow hall and the telephone center are jam-packed 24/7. There are more people asking for directions. A few days ago, the loud siren sounded, and the "big voice" speakers bellowed "INCOMING! INCOMING!". A group of new Marines scattered like ducklings under the shadow of a hawk. Several ran around the corner of a concrete barrier and into a group of us chatting on as though nothing had happened. We watched as they collected themselves and tried to pretend as though nothing had happened, and then returned to conversation. It wasn't so long ago that I was doing the same thing, along with the rest of the platoon. It took us some time to realize that the siren will inevitably go off after the incoming round hits. There are times when an explosion does not precede the siren- we raucously jeer "Watch out! Big bird crapping on the radar again! ", and listen for the big voice to call out "All clear" moments later. I'm told that there are bases in Iraq where the siren is accurate, and you should duck when it sounds. Falluja is not one of those places- neither is Ramadi. 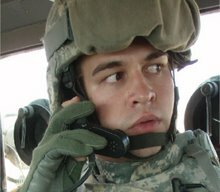 I remember when I was new to Iraq, when I flinched at the sound of any explosion. I had to learn the difference between incoming and outgoing rounds. It took several weeks before I stopped flinching when the outgoing boomed overhead. Outgoing fire booms- if it's mortar fire, sometimes you can hear the whizzz of the shell. Incoming rounds cruump- if you hear whizzing, you were way too close to it. Sometimes, it's hard to tell the difference, and now, we've seen what indirect fire can do to someone. I've started flinching again. I'm guest blogging this week over at Patterico's site. I'm joined by Badger 6 and a whole crew of other illuminated pontiffs. Stop by and check it out! I also have the story, in pictures, of a recent route clearance mission featured on Pajamas Media. Acute Politics will soon become a PJM affiliated blog. That will mean an advertisement or two on the page here, as well as a spot on the PJM blogroll and (hopefully!) some increased traffic. Lastly, Acute Politics will be featured in the PBS documentary America at a Crossroads. The documentary series begins at 9pm on April 15. Acute Politics will appear on April 16 at 10pm in the segment Operation Homecoming: Writing the Wartime. Desert Flier is the blog of Navy LT Carl Goforth, a Trauma/Flight nurse in Ar Ramadi. His entries range from the mundane to very frank descriptions of what he deals with on the job. "The time for dictatorship is gone, and we are welcoming the new dawn of democracy and freedom here"
from Sheik Abdul Sattar Abu Risha, the leader of the Anbar Salvation Council.